A bad nights sleep and a cold, grey morning demand a cup of coffee, served in your branded travel mug! Give your customers a useful and re-usable item with these customised thermo mugs. We offer mugs made from ceramic and stainless steel for optimum heat retention and style. Your customers will carry your promotional cups & mugs to work and be reminded of your brand all day long. Your name will be associated with warmth, protection and the smell of coffee or tea. Have a look through our web shop and choose thermal mugs as your promotional products of choice. The use of thermo mugs as advertising items is a growing trend. More and more businesses are realising that offering high quality and most importantly useful giveaways to their audience and key clients is a great way to establish a personal connection with them. Doing so can get people thinking fondly of your business and make your interactions with them less cold. Almost any product can be imprinted with your logo but by far the most effective ones are reusable and multi use ones. The products found in our mug range can be reused and with thermo mugs and flasks in particular used for multiple purposes (keeping beverages hot or cold!). So order yours now and find out what all the fuss is about. Thermo mugs are insulated drinking containers for your beverages. The principle of insolation can be traced back to the Scottish chemist and physicist James Dewar. In 1874, he started to work on the development of an insulated container. The double walled transport and storage containers (which were made out of mirrored glass) have completed development in 1893 and were called Dewar – Containers. Without any connection to the discovery of the Scottish scientist, a German professor called Adolf Ferdinand Weinhold also discovered the Insulation principle and mentioned a vacuum-jacket bottle as a predecessor of today’s promotional thermos flask in his writings. The first steps, towards commercialisation, have been made by Reinhold Burger. He used the idea of the vacuum jacket, researched potential applications and patented the insulated mug in 1903. Nowadays, thermo mugs are used by many on the way to work, university or school as well as to meetings or to the airport; thermo mugs are one of the most popular items for people on the go. Most people enjoy a warm beverage in the morning and the evening, which lifts the mood and brings warmth on cold days. These portable promotional mugs are practical because it allows you to take your own drink from home and keep it hot long after you’ve gotten to work. Thanks to the insulation of the flask, the drink will stay heated throughout the whole journey. Adding to the incredible versatility of this product, these mugs not only keep hot drinks hot but also keep cold drinks cold. If that isn’t amazing user value, then we don’t know what is! 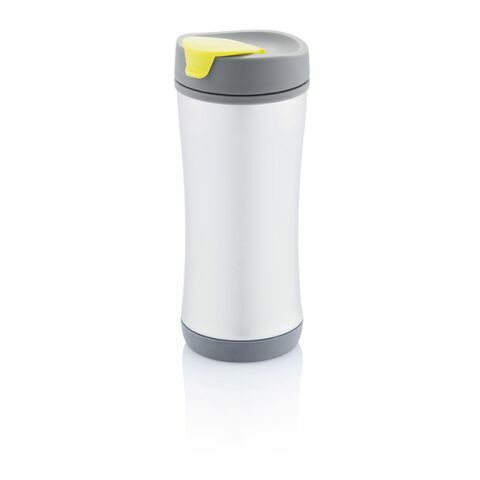 The thermo flask has a high user value, as this is a product designed to be used on the go, you can be assured your logo will be viewed by countless other people on your customer’s daily commute. These promotional items can be given out at Christmas events filled with mulled wine, or at summer festivals, filled with fresh iced tea. You can also give these thermo mugs, personalised according to your corporate logo, to co-workers, clients or business partners as a gift. The thermo mug is a unique and different kind of promotional tool that can advertise your business on the go, unlike the more typically used printed cambridge mugs or generic promotional coffee mugs. It has the added benefits of keeping drinks both hot and cold and promotes environmental awareness through its re-usable nature. As well as morning commutes and hiking trips, your clients can take their personalised thermo flask to their local coffee house, and ask them to make their morning coffee in their thermos instead, to save on unnecessary cardboard waste. Should your promotional cups be with out without a handle? Should it be colourful or silver? Made out of premium stainless steel or ceramics? Decorated via silkscreen print or laser engraving? There are many ways to customise your travel flasks, we have versions made out of plastic, long-lasting versions made out of ceramics with a silicon lid, or premium, durable ones made from stainless steel. 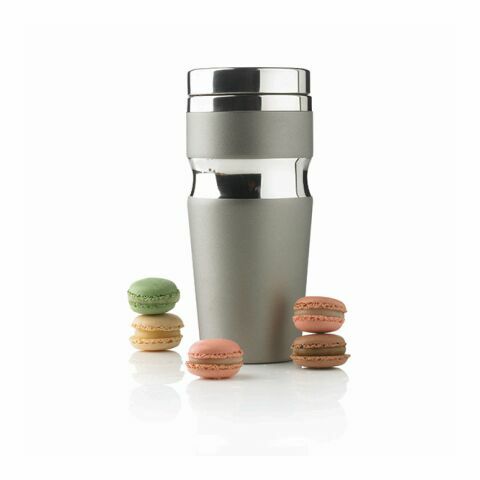 There are many varieties to choose from, including a travellers set, which comes with a thermo and two insulated cups. There are also thermos mugs with lids that double as portable cups. 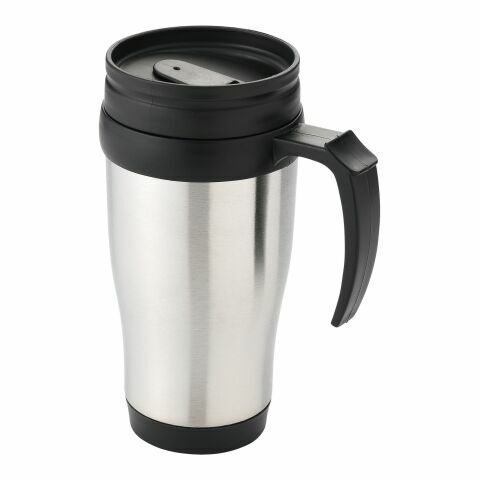 The thermal mug ‘Americano’ has ribbed silicon ridges, offering additional comfort and heat protection. We at allbranded also recommend the ‘Arizona’ which has an inbuilt container, ideal for carrying coffee pads, cookies or sugar. Take a look through our website and decorate your promotional gifts with a print or engraving of your corporate design.